A walk for all seasons, but especially so in Autumn with the bracken turning golden brown, adding colour to the scene. Heading south of Hutton the route follows green lanes and tracks past Lingmoor Farm back to the main road, The route plunges into the secret valley of Douthwaite Dale where there was formerly a mill at Yoadwath on the River Dove. Once up the other side its easy going to Gillamoor with its unusual sundial, an interesting church, and 'surprise view'. After re-crossing the Dove its on across fields and moorland back to Hutton-le-Hole with an optional detour up onto Shepherds Nab. Terrain Walking mostly on field and woodland paths and tracks - it can be muddy in places with a couple of steady ups and downs, but nothing too strenuous. A mix of farmland, woodland and moor, together with the picturesque villages of Hutton and Gillamoor to explore. 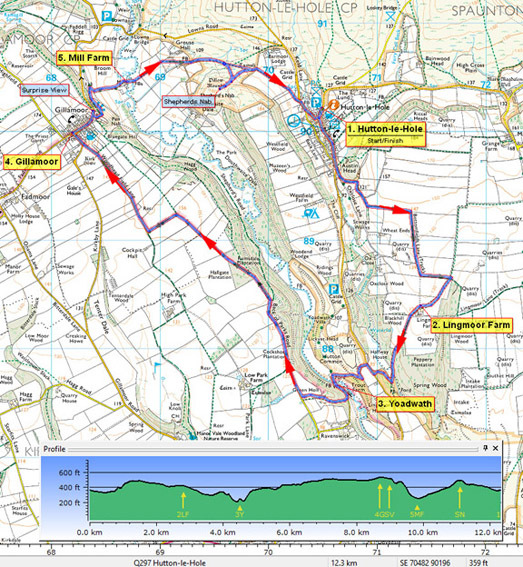 (Start) Hutton-le-Hole is a fascinating place, but save any exploring until the finish. Set off south through the village, and just after crossing the pretty beck, take a track off to the left. Keep to the track (bridleway) that curves round below Austin Head, then bear right through a gate climbing steadily up through trees. As a green lane, the path continues skirting farmland across this upland plateau. When you are in sight of Lingmoor Farm, the direct approach isn't a right-of-way. Turn left keeping to the bridleway, then in about 200m, as you begin to descend look out for a footpath on the right. Take this path along the side of a field under trees to reach Lingmoor Farm. (2.8km/ 1¾ miles) Here cross the track you could see earlier to skirt the farm and join the farm road. Walk down the road into woodland to a bridge over Hutton Beck. As the road climbs from the bridge look out for a track into the woods on your right. Turn along this track and follow it up through the woods round to the main road. Walk along the roadside crossing when safe to do so to a Veterinary Practice building and follow the track behind the building. There are various paths and tracks in this area of access land. Continue along the top until you spot a path heading diagonally right down into the valley through scrubby undergrowth. Head down this path to emerge on at lane at the bottom. Walk past a few cottages and cross the River Dove by a footbridge near a weir just upstream of the former Yoadwath water mill. (4.7km/ 3 miles) You now face a climb up the lane out of the dale. About 100m up the hill, look out for a footpath sign on the right. Follow this path up through the trees to the top. Emerging into the open, there is no indication of the path but bearing right a track skirts round this overgrown area to a minor road. Turn right along this road known as 'Back o' Parks Road'. Now the route becomes straightforward - following this track for about 2.5km all the way to Gillamoor. For the purpose of this walk, ignore other bridleways and footpaths, and keep to the lane which soon loses its metalled surface, becoming a tractor track serving this upland plateau. The track turns left (where a footpath to Gillamoor goes straight on but would involve crossing 6 fields!) and then right, becoming a metalled lane once more. After passing the playing fields you come to the green in Gillamoor and the Royal Oak pub, making this a convenient spot for a break. (8.8km/5½ miles) Walk through the village passing an unusual sundial on your left, to reach St Aiden's Church at the north end of the village. Here it's worth continuing along the road for a few yards to 'Surprise View' where you can survey the panorama across the river valley towards Farndale and the Moors. After taking in the view retrace steps and turn down the path below the church. This path bears left and descends the bank below Surprise View to join a track. Go right here for a few yards then left down the track towards Mill Farm. Leave the track for the footpath that skirts to the left of the buildings and crosses the former mill stream and the River Dove by footbridges. Note that there may be cattle here. Don’t miss 'Surprise View' at Gillamoor, the views from Shepherds Nab, and if time permits, the Ryedale Folk Museum in Hutton-le-Hole.